Time: 9:00 to 2:30 pm. Come for an hour, come for the whole day. Childhood Developmental Disorders affect at least 1 in 5 families. With Autism, mainstream medicine relies on behavioural therapy and speech therapy as the only effective treatments, dismissing biomedical research and clinical experience that comes in everyday. ADHD treatment from the mainstream also relies on its mainstays: Ritalin, Concerta and Strattera. Parents must do their own research to learn there are other effective treatments, which are truly complimentary to the mainstream options. Most parents don’t have time to pour over books or videos, and possibly can’t process the information from these resources to distill out what is necessary for their children. That’s why ONWC offers seminars: to help work through the information and get to the important stuff. The ONWC Team offers over 15 of experience that helps children recover lost capabilities, enabling them to function better in the modern world. The whole family becomes healthier because of the treatments and lifestyle improvements that are recommended for the children. The focus of this year’s program is The Environment: How Intoxicants Affect Your Brain. Our speakers will expose the threats, helping you to learn how to protect yourselves and your children. Jeff McArthur of Pure Air Experts is our featured guest. Jeff recovered from health problems that were caused by “polluting” of the air, food and water. Other sessions will review the science of environmental medicine, including how diet can be both a source of contamination but also help protect you. 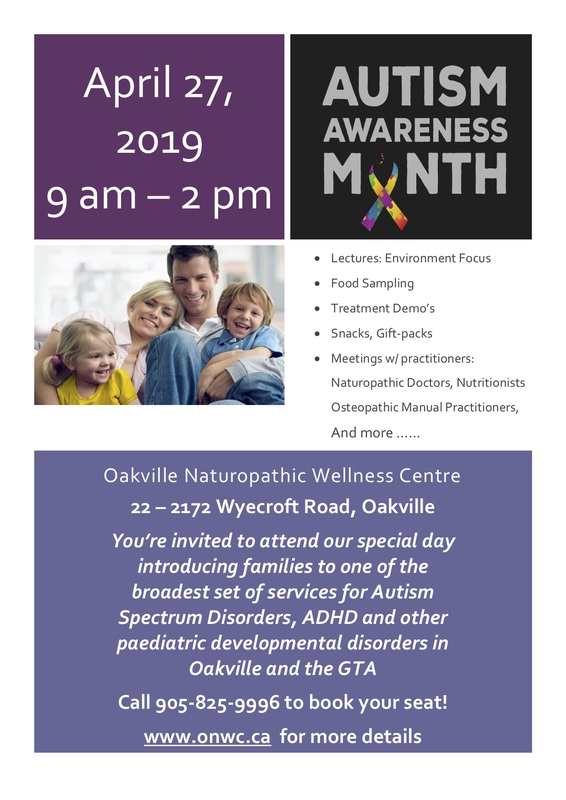 The day will also introduce attendees to unique therapies that have helped past patients: NAET (Nambudripad’s Allergy Elimination Techniques), Osteopathic Manual Therapy (aka Osteopathy), and unique “tricks” for getting difficult (yucky) supplements into your children. Please register by calling 905-825-9996. Space truly is limited, so it’s very important that you register yourself, and any family or friends you choose to bring.